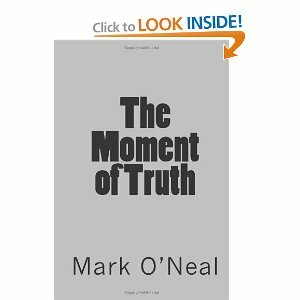 When I decided to readThe Moment of Truth by Mark O’Neal, the novel sounded as if it had a lot to do with basketball. I thought it might be interesting because I liked the idea of a novel connected to this topic and I was interested to see what O’Neal took this subject. Mo is a basketball star with a checkered past – he has a gang background but he has chosen to turn his life around. Unfortunately, his past (and the pasts of those connected with him) decide to catch up with him. He learns that his girlfriend has been lying to him about the paternity of her child and then he is kidnapped by gangsters from his former life who want him to lead them to some valuable items that his father stole many years ago. Mo’s only chance to live is to figure out where his father (who he hasn’t spoken to in 2 decades) has hidden these items – if he is able to do this, he might be able to go free. In all honesty, I really didn’t enjoy The Moment of Truth at all. I couldn’t related to the characters and I found that they seemed two-dimensional – there was no depth to them at all or anything about them that made me feel like I had a vested interest in what happened to them. I found the dialogue stilted and the whole plot contrived. These weak elements made a novel that should have moved quickly (it is only 168 pages in length) drag on for what felt like an eternity. While I wish O’Neal well in his future endeavours, I wouldn’t recommend this book because I found nothing interesting, entertaining or enjoyable about it.